I’ll admit I don’t get fancy when I eat shrimp. I usually like it with butter and a little garlic, and that is plenty. However, whenever we eat at Bonefish Grill, my whole family goes crazy for their Bang Bang Shrimp dish. It is so zesty and delicious that I eat the whole platter! 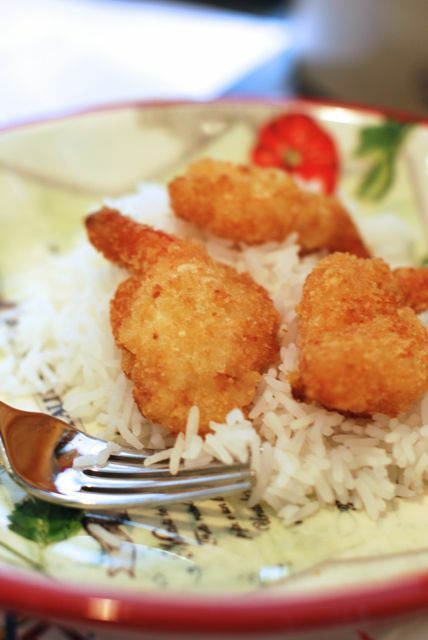 Since we don’t live too close to the restaurant I’ve begun making my own copycat Bonefish Grill Bang Bang Shrimp recipe. It is lighter and a little less salty, but still tastes amazing. Step 1: In a small bowl whisk the mayo, chili sauce, and Sriracha. In a separate bowl pour the cornstarch. Step 2: Pour enough vegetable oil in a deep bottomed pan so that it comes 2 inches up the side. Then heat it until it is 375 degrees F.
Step 3: Dip the shrimp in the cornstarch until coated. Then shake off the excess. Fry it in the hot vegetable oil for 3 to 5 minutes, then transfer it to a plate lined with a paper towel. Step 4: Once the shrimp has drained, drizzle it with the mayonnaise sauce and serve!